Among the Neuland literature-selection you will find specialist literature with topics of visualization or visual facilitation and graphic recording, presentation and business. We are particularly proud of our internationally successful bestseller bikablo®-series, which were published together with Kommunikationslotsen. The learning maps series, which offer the quick and compact orientation in the great world of dialogue-driven methods, arises from the same cooperation. Visual Dictionary - New visuals for meetings, training & learning! How to use your listening, thinking and drawing skills to make meaning. German Version! 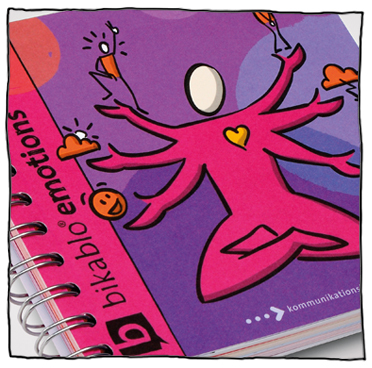 A bikablo® visualization training book.